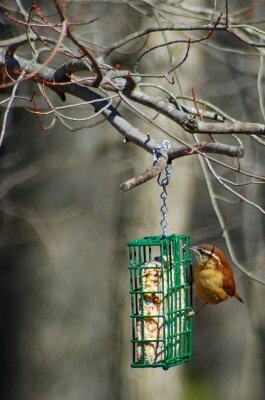 Suet cannot just be tossed into a platform feeder or left out for weeks at a time, however, and there are steps every backyard birder should take to offer this healthy treat in a safe, easy way. Suet feeders come in different styles such as logs, cages or nets, but they all allow birds to easily cling where they can access the suet. Woodpeckers, nuthatches and other clinging birds prefer suet, and it is essential to provide a way these birds can comfortably get to the treat. While plain suet can be offered to backyard birds, choosing a blend with bits of nuts, fruit or insects mixed in will attract more birds and offer even more nutrition. If squirrels are just as attracted to the suet, try a hot pepper blend to discourage them (birds don't mind hot tastes!). Many birds that enjoy suet can be solitary or shy at backyard feeding stations, and the suet feeder should be positioned near trees where the birds are likely to be perching. Feeders can even be attached directly to tree trunks for easy and convenient access. Suet can quickly spoil or melt on warm days, creating an unsightly, stinky mess. Position the suet feeder in a deeply shaded spot to keep it cool, and avoid offering suet during the hot summer months. If necessary, freeze the suet before filling the feeder, and birds will feed on it gradually as it thaws. Birds are not the only backyard visitors that will enjoy suet – raccoons, rats, bears, chipmunks and other wildlife may also try the treat. To avoid their attention, use a wide baffle to protect the feeder and consider bringing suet feeders into a secure garage or shed at night when birds are not feeding but other wildlife is looking for a meal. While suet is a healthy option for backyard birds, it is best to only put out enough suet to be consumed in just a few days. Limiting the amount offered at once will help keep it from going bad or attracting unwanted visitors. Suet is a great addition to any backyard bird buffet, and if it's offered properly, it will become a healthy and nutritious part of many birds' diets.